Those diffusers look mathematically accurate. Are they DIY? My favorite pic is the second from the bottom. 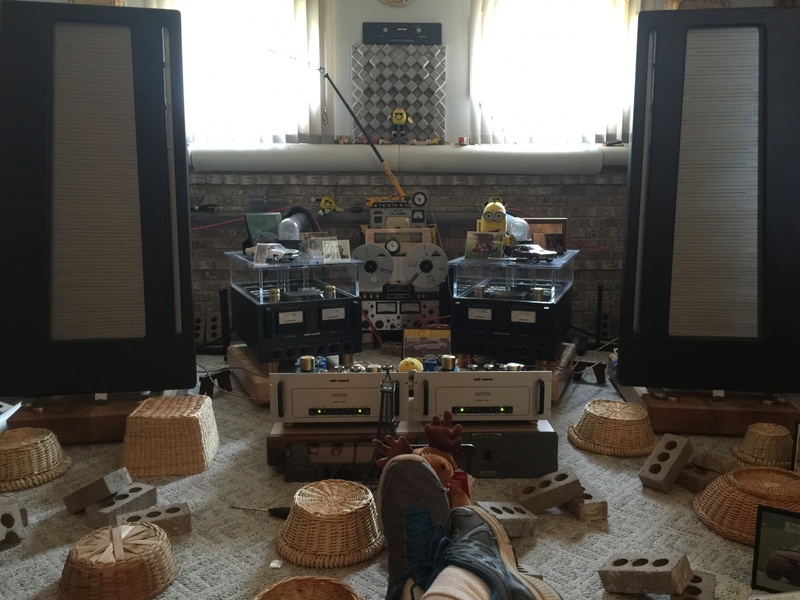 Is that a vintage Pioneer spring reverb unit in the lower right? I'm sure it is. He has 17 vintage tuners for sure all from the 60s-mid 70s. He's a collector and is constantly upgrading the caps and other parts to bring life to them. His system plays 24/7 when on the solid state gear but he does shut it off for the tube stuff to preserve hours. When I was up there last week I listened to his apogee's with the Krell 350 monoblocks. He has some 12 layers of isolation under his turntable which includes the custom 4" thick maple shelve he made. All the maple blocks he made except for the ones under the krells those are from mapleshade. The diffusers right above speakers are the RPG skyline there are 18 of them and he bought them when they were made back in the mid 90s at a dealer cost of 75/ea. now they are alot more. The boards that run along the ceiling/wall are a mimic of the RPG flutter free product and he made those himself using 2x6 material. He says the baskets work good and are cheap just goto any hobby store or he bought his from Pier 1 imports for around 10/ea. The diffusers on the left/right of each octa window are little mini rpgs that were from an audio show he got for 50ea and the center rpg 2d was another one he got at an audio show for cheap. I really should of got a shot of the other side of the rack.... there are a thousand cords it's crazy. He even has two splitter banks for his FM antenna on his roof (he has two antennas) so all the tuners can share. Now I am mad Talley, you came into my state and did not tell me ?? We at least needed to have a drink and say hi. You need to be punished now. HA... well we went through texarkana to memphis and came up 57 through Ill. which is the quickest route for us. 15hrs and 22min to de monte where my sister is. Ahhh yes De Motte Indiana, very nice place. Well I hope to meet you one day never the less. I do hope you waved as you went by. 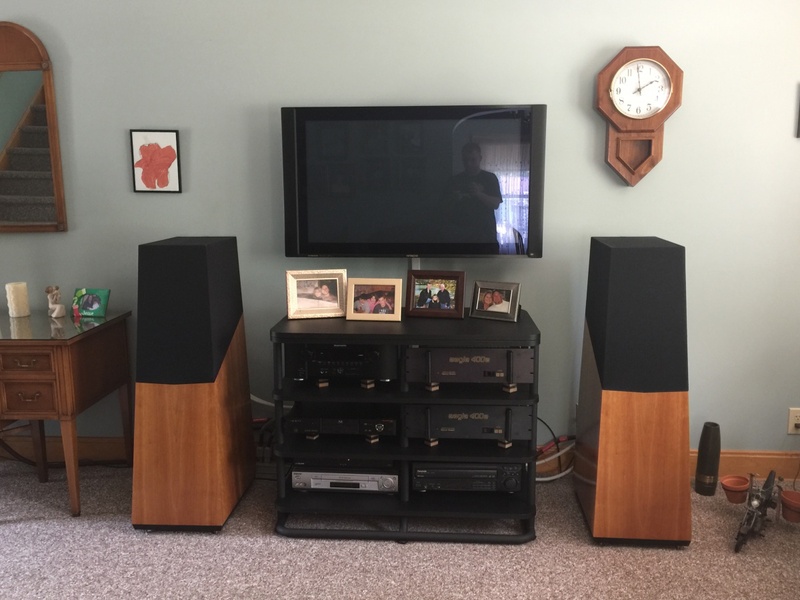 Garage speakers look like vintage Acoustic Research speakers (or Advents)! Seems like uncle has some very expensive hobbies indeed!!!! Yes they are Advents in his garage. Went back up there this past week for another vacation and enjoyed some listening. Truly amazing system it is. 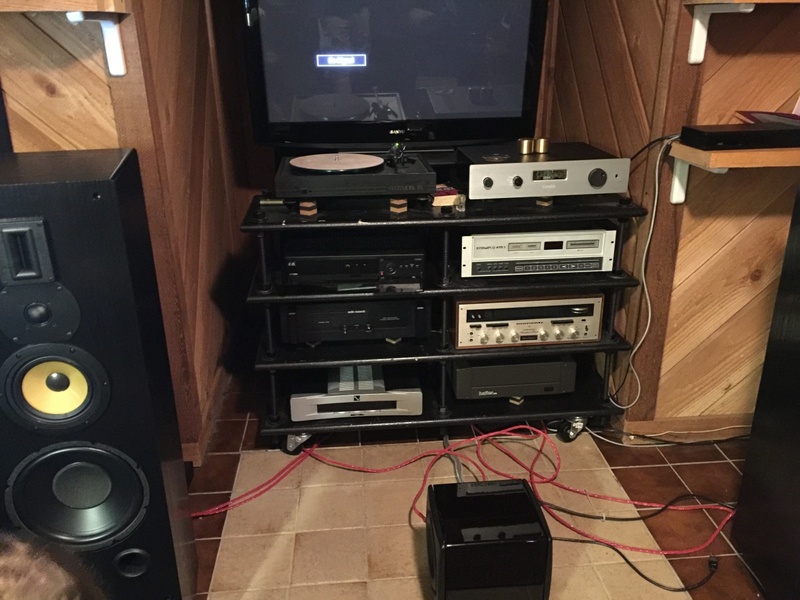 I also snapped of a photo of his living room TV speakers (Vandersteen 5C Signatures) and also his basement system too. Man, the power bills he must have!!! He is on an average plan so he only pays 365/mo for his light bill. Only $365 per month... YIKES! We pay an average of $100-$150. $365 a month pays for my car lease.